Oops, that previous post got away from me before I meant to post it. The parents must show the child that they are dead serious about bedtime. There are no other options. The child needs to learn how to put him/herself to sleep. Apparently, the increasingly long intervals help him/her with that. Since 27 December 2006, bedtime has ceased to be internecine combat. It’s made our evenings our own. It’s helped preserve our sanity. If I were a religious man, I’d say that Solve Your Child’s Sleep Problems was God sent. If only we didn’t have to wait until Ian was over three to find it! But then, maybe he wouldn’t have been ready for it earlier. Who knows? He still has a lot of trouble taking naps (and is cranky and unpleasant when he hasn’t), but it’s harder to apply this method to naptime because we only have the weekends to work on it and during the week he’s at daycare at naptime (and he usually takes naps there). In any event, Dr. Richard Ferber, you have our thanks! From birth, it has been difficult for the Notorious Jigb to get to sleep. 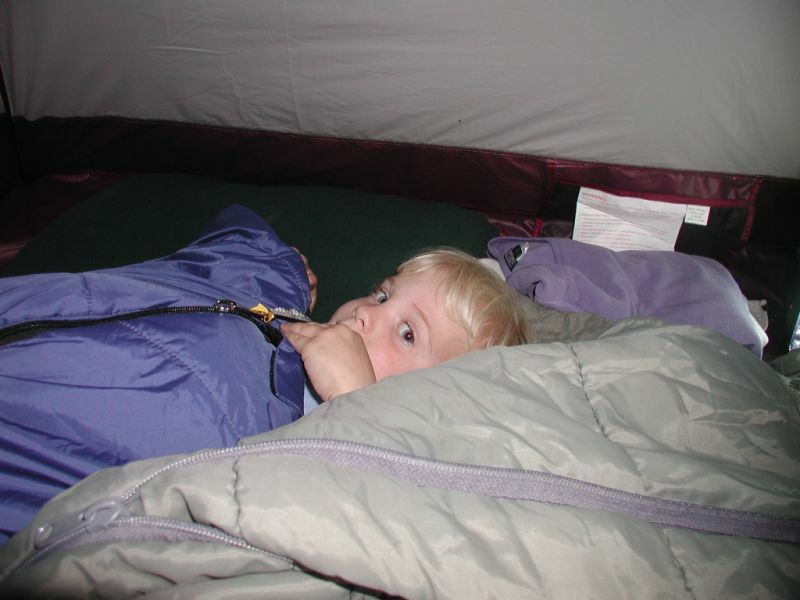 Initially, it was colic that kept him (and his parents) up at night. That was particularly hard for Marysia and me, because everyone is so concerned about SIDS (Sudden Infant Death Syndrome) that there’s a lot of propaganda advocating “back to sleep”–that is, you must put the child to sleep on his/her back. But our colicy baby only wanted to sleep on his stomach. So, for a few hours, we’d let Ian sleep on his stomach so that he and we might rest, but we’d feel terribly guilty about it and keep checking him to make sure he was breathing. That went on for weeks until his doctor finally said, if he can hold his head up, it’s fine to let him sleep on his stomach. Thus, one sleep problem was dealt with, but subsequently Ian decided that he just didn’t like to go to sleep. Virtually every night, for at over two years, he battled going to sleep at night. Some nights were worse than others, but few nights were easy. (And nap battles were so bad that when he and Marysia were alone in Poland for 5 months he almost never napped.) We tried various techniques to get him to sleep–cajoling, threatening, offering rewards, letting him cry it out. 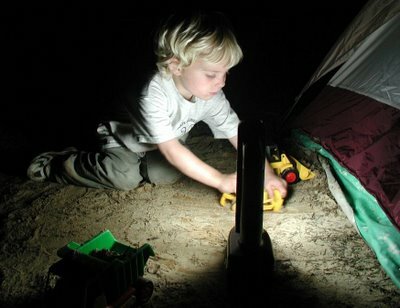 The worst nights were marked by him screaming for an hour and a half or more–making it difficult to do anything else in the house. It was taking its psychic toll on Marysia and me. Then, on 27 December 2006, we were at Books-a-Million, a local Alabama bookstore, and we stumbled upon a book that spoke to us: Dr. Richard Ferber’s Solve Your Child’s Sleep Problems. We were both very skeptical, but it was encouraging to see that Ferber is the director of the Center for Pediatric Sleep Disorders, Children’s Hospital, Boston. If he doesn’t know kids’ sleep issues, who does? With our skepticism in full force, we tried his method. It’s quite simple. The parent puts the kid to sleep and, in no uncertain terms, tells him/her that it’s bedtime. No other options are open. Inevitably, the child cries. The parent waits 3 minutes, then goes into the bedroom and, without really engaging the child or patting him/her or getting a glass of water or whatever, the parent reinforces that it’s bed time. The child continues to cry and the parent returns in increasingly longer intervals: 5 minutes, 10 minutes, 15 minutes, 20 minutes. The next night, the process begins again, but the intervals get longer: 10 minutes at first, then 15, 20, 25, etc. After four days of this, Ian’s sleep problems was solved! Four days! We were astonished at how fast it worked. After a mere four days, Ian was settling down after being read three books and was not complaining about going to bed. He even asks to have his door closed “so that Java won’t come in” his room. Occasionally, he might talk to himself for 10 or 15 minutes, but that’s it! No screaming! “We ‘sposed be go that way!” (for “We’re supposed to go that way,” or maybe “We’re supposed to be going that way”). And, of course, “Let’s don’t” instead of “Let’s not,” but this one he could very well have picked up from some native Alabamians. 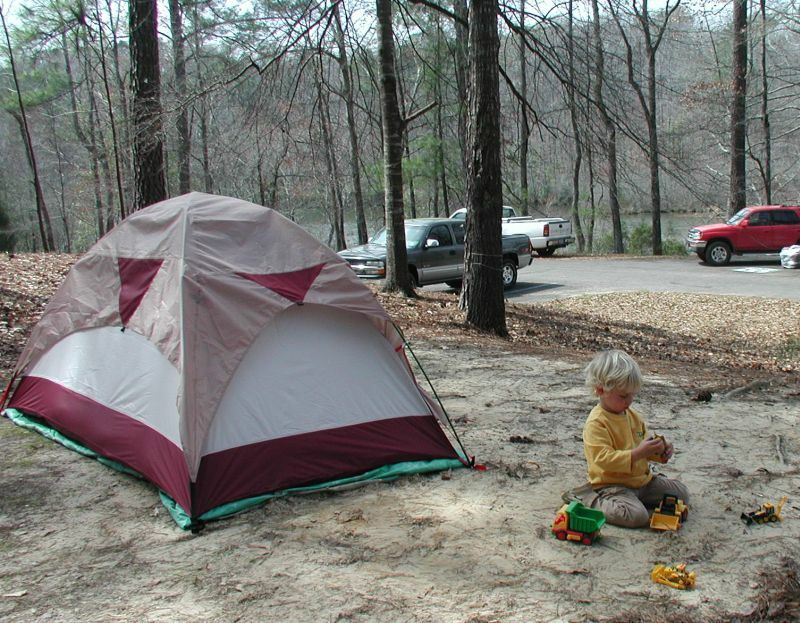 Ian took his first camping trip this week, at near-by Lake Lurleen. We had a great time and Ian is a natural born camper. He loved the whole experience, but some of his favorite things included: sleeping in his sleeping bag; using the flashlights; throwing sticks in the lake; and playing with his trucks in the dirt. He didn’t have a single potty accident all weekend–it’s gotten to the point where he tells me when he has to go. I got a campsite right by the bathrooms to make our trips there easier. I must say we were not your conventional Lake Lurleen Campers. For one, I don’t have a pickup truck. For two, I’m not male, retired, or part of a big family. Still, all the other campers were very nice, especially an extended family in a pop-up trailer across the way. The grandmother’s first question was, “are you alone?’ When I pointed to Ian, and said I’m with him, she responded, “He’s your man?” But it was all in good humor. When I decided to go on this trip, it didn’t even occur to me we’d stand out like this. I was also surprised that most campers are from Tuscaloosa county (and this is something I had in common with them). After playing for quite a while by the light of a florescent lantern, Ian fell right to sleep and slept soundly until dawn, which thanks to DST was around 7 AM (sorry Jeremy). The first thing Ian wanted to do, even before breakfast, was hike to the playground. Lake Lurleen is well set up for kids, with at least 3 playgrounds. The playground equipment was still wet with dew, so we spent a long time throwing pine cones into a stream and using sticks to coax them downstream. After breakfast, we went on a hike that turned out to be much longer and hotter than I had anticipated, but the views were beautiful, and Ian enjoyed touching the moss, kicking sand, and poking at logs that were decaying into dirt. He didn’t want to leave, and I didn’t either, but we finally packed up the campsite at 3:30 and headed home. Ian fell asleep in the car within minutes. I drove around for about 40 minutes (we only live 20 minutes from the park), and then came home. Ian didn’t stir. It was too hot to leave him in the car, so I carried him inside. He barely woke as I set him on the bed, but fell right back to sleep. I finally woke him up at 5:30. I guess camping wore him out!